Melting makeup, shiny skin, and large pores. These are a few of my least favorite things. Having oily skin isn't all it's cracked up to be, even when people tell you that you might get less wrinkles. Struggling with oily skin has been a pain for as long as I can remember, and finding the right foundation is equally as difficult. BareMinerals products have been around for such a long time and I can still remember watching infomercials, fascinated by the transformations. It's no surprise then, that I've fallen in love with their loose matte foundation. Finding the right powder foundation can be as much of a struggle as finding any other formulation. Once you find one, the difference is amazing. It looks so much more fresh, natural and not to mention it's a huge time-saver. I've gotten ready in a fraction of the time that it used to take with liquid foundation. My skin feels better, my brushes are easier to clean, and washing my makeup off is a breeze at the end of the day. 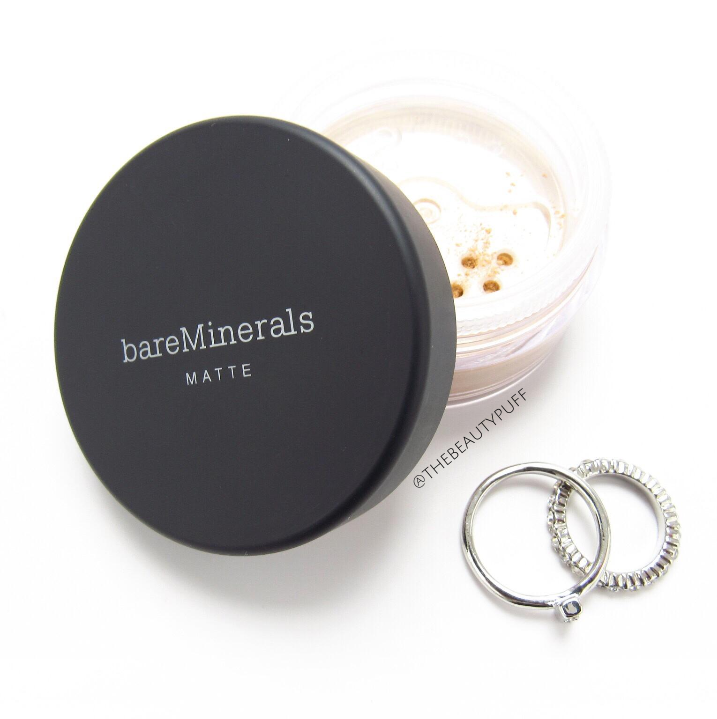 The bareMinerals Matte Foundation with SPF 15 is loose and comes in a jar with a twisting dispenser that can be closed for storage or travel. I just pour a bit into the lid, swirl, tap off the excess and buff into the skin. As with any powder, always apply your liquid or cream concealer first. Everything blends beautifully because this foundation isn't heavy or powdery on the skin. While I don't find that this foundation clings to dry patches, I will say that I am sure to moisturize thoroughly before application (as I would with any other foundation). If you're looking for a matte foundation, you still need to keep your skin hydrated during the day. I don't use any setting sprays but I get great wear out of this foundation over the course of about eight hours. Touch-ups are really easy and the makeup never looks overdone or heavy afterwards. The finish and feeling I get from this foundation are well worth any minor touch-ups. It's my ideal look for my oily skin - as natural as possible! If you've been on the fence about powder foundations, definitely give bareMinerals a try. There are different finishes for different skin types so you can find one that suits you best! Shop this foundation and other bareMinerals products on the Notino website below.